Charles Darwin University (CDU) exchange student Thomas Schmeichen’s experience in the study abroad program gave him the opportunity to travel overseas and retrace his family’s roots. 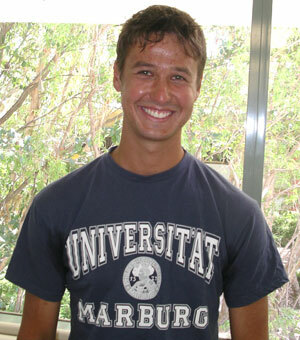 Thomas travelled to Marburg in Germany in Semester 2, 2006 as a part of CDU’s study abroad program. “I found out about the opportunity to go to Marburg… when I met three people on exchange from Marburg here on campus,” Thomas said. In an exciting coincidence, his exchange placement in 2006 fell on the 50th anniversary of his family moving from Marburg to Australia. “I have always been interested in Germany, in the culture and in where my family came from. I lived in the actual building in the medieval city of Marburg where my grandmother was born, which was pretty surreal,” Thomas said. Thomas’ advice to other students who are thinking about undertaking the Marburg exchange is to start learning the German language and culture through the ISU Program. “The ISU Program is a summer study program which offers seminars on current European and German, political, economic and cultural topics, German language courses, and an extensive cultural and excursion program,” he said. For further information on study abroad and exchange programs, contact Therese Fitzgerald, therese.fitzgerald@cdu.edu.au or have a look at the website: www.cdu.edu.au/international/current/exchange-program.htm.